Hattiesburg Clinic, Mississippi’s largest private multi-specialty medical group, and the University of Mississippi Medical Center, the state’s only academic medical center, are embarking on a collaborative effort to ensure that patients receive the highest quality of care through innovative use of electronic health records. The initiative calls for the physician-owned and managed Hattiesburg Clinic to share with the Medical Center its expertise in the use of the Epic electronic health record and its centralized approach to wellness and disease management, all essential components of building more efficient and higher quality systems of care. UMMC also uses Epic as its vendor for electronic health records. 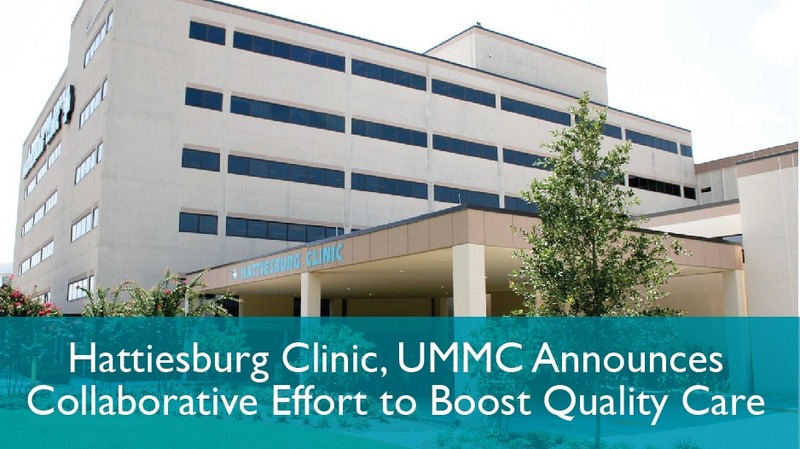 “We are partnering to develop an infrastructure to deliver the highest quality care at the lowest cost to all Mississippians,” said John M. Fitzpatrick, MD, a board-certified nephrologist and president of the Hattiesburg Clinic Board of Directors. “The strategies focus on wellness and prevention, better management of chronic diseases using case manager registered nurses, and a variety of registries to identify care gaps in the various populations,” he said. One of Epic’s most progressive and innovative features is its “Healthy Planet” module. Healthy Planet collects and aggregates patient data, giving doctors, nurses, social workers and other health care providers the electronic tools to better coordinate delivery of patient care and to take a much wider view of a patient’s medical history, current issues and ongoing needs. It allows providers to monitor quality and cost, to track how well they’re doing on each, and to prioritize their patient-centered care. The goal of Healthy Planet is to ensure patients, especially those with chronic diseases, are as healthy as possible and getting proactive care. The Healthy Planet module is a population health tool, meaning it tracks and even predicts factors such as comorbidities for patients with chronic illnesses, and their risk for illness from other societal factors – for example, poverty or physical living environment – that can contribute to bad health. “The beauty of the Healthy Planet tools is that they bring a lot of information into a seamless platform to use to make sure patients have better outcomes, and further optimize the entire health care team so that everyone is working together and using the tools to promote healthy outcomes,” she said. The collaborative effort will be especially important in serving Mississippi’s most vulnerable residents, including Medicare and Medicaid patients, UMMC and Hattiesburg Clinic leaders say. As noted by the national Healthcare Information and Management Systems Society, or HIMSS, “Hattiesburg Clinic has the best build of Epic in the country to deliver population health,” Fitzpatrick said. The Clinic in 2017 made perfect scores on quality measures impacting about 20,000 Medicare patients and lowered its total cost of care by $3.9 million, Fitzpatrick said. “A key driver of this agreement is to develop programs that use similar approaches for Medicaid patients,” he said. Hattiesburg Clinic’s approach to medical care “is very similar to ours,” O’Mara said. “We view this as an opportunity for the state’s only academic medical center to take part in a collaborative effort with a forward-thinking private practice group. This is a news release by the University of Mississippi Medical Center’s Division of Public Affairs.